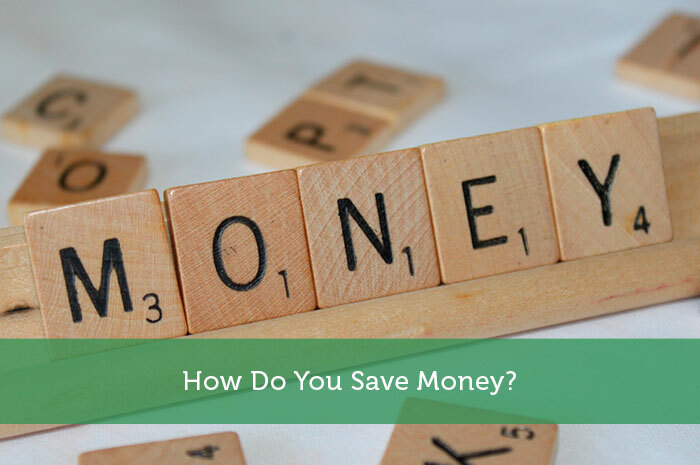 If you’re a frugal or personal finance blogger, you know the importance of saving money. More importantly, you probably engineer new ways to put more money in your piggy bank all the time. Today, I figured I’d share a few ways that I save money with you in hopes that you’ll share a few with me in comments! The Dollar Trick – Last month, Ana and I were able to save over a thousand dollars toward our wedding. Of that more $1,000+, more than a hundred dollars was contributed through the dollar trick. Most of us don’t like having change in our pockets. So, when we get home, we dump the change in a jar and forget about it. Well, Ana and I have decided to do that with dollar bills. When we spend money and get singles as change, they go in our pocket rather than our wallet…this way we don’t spend them. Then, when we get home, the dollar bills go into the change jar and we forget about them. I had no idea this would be so effective, but it really is! Drink Through A Straw – Ana and I are young twenty somethings. With that in mind, it’s not rare for us to want to go to the bar and play pool while having a few drinks to wind down after a long day. A little while ago, I started noticing that when I have a drink in my hand, I have a habit of drinking it fast. Honestly, I didn’t even realize this until my buddy pointed out that he had half his drink left and mine was gone after chuckling and saying “you’re really trying to get there aren’t you?” So from that day forward, I started putting one of those little stir straws in my alcoholic beverages. This way, it forces me to drink slower and I don’t drink half as much! Cut Out Fast Food – OK, my name is Joshua Rodriguez and I’ve got a confession to make…I’m a fast food junkie. I would choose Mc. Donald’s over Outback any day and twice on Sunday. However, this creates a problem for me. Because eating out is exponentially cheaper for me than someone who likes to eat at a dine in place, I tend to do it much more. Unfortunately, the numbers add up very fast. So, in the past month, I’ve eaten a lot less fast food. As a matter of fact, Monday is my fast food day. If it’s not Monday, I’m not allowed…The reason I did this is because I’m crazy busy on Monday and never want to leave the house. So, if I want fast food, I’ve got to inconvenience myself on my busiest day to get it. Well, that’s about it. These 3 simple tips took my savings this month from the average of $350 to $500 and more than doubled it! That’s right, we saved over a grand making 3 small lifestyle changes! What are some creative things you do to save money? I have always had a coin jar. I usually make about £100 a year from that. I normally only save change smaller than 50p though! I also usually alternate alcohol with water when in a bar. Cheaper and generally no hangover = result!! Great idea about the dollar bills! Would love to start that! We actually give any change left from the day to our kids. By doing this, it gives us the opportunity to teach them about giving, saving, and spending. I overhead my oldest ‘teaching’ our youngest about giving the other day and, I have to admit, that made it all worth while! I love all of your ideas. I don’t go out as much yet, I never get to save. Bills are piling up. Anyway, these are really simple lifestyle changes that I can really do. Thanks for the great tips. Great ideas! These methods could be a huge help if it is regularly used. Especially about using a straw, it could as well make you some healthy benefits. We get an allotted amount of ‘fun money’ every week. If I am saving for a gift for someone, I usually try to squirrel away $5 – 15 each week from that until I meet my goal. I’m a fan of the $1 trick. In fact, I used to do the $5 trick! It’s tough at first, but then you get used to living without it after a while.